Guangzhou Huadu in Guangzhou city of architectural construction of Huadu District, North Wing Fat Road junction. Transportation connections: next to the 107 National Highway, Guangzhou-Qingyuan Expressway, 106 State Road 6 east-west highway north and south; Huadu, Guangzhou North Railway Station through the country; in shipping, the flowers have a very large shipping port throughput: Connection Huadu Metro Line 3, Light Rail, Northern Ring Line 2 have been built, and communication of the speed a Greater Pearl River Delta; Huadu, Guangzhou new Baiyun International Airport opening is formed a full three-dimensional transport network, the traffic is very convenient. Flowers decorate the city is building "Flower City Market Management Company Limited installed", investment and development since 2004, to operate in high-grade building materials, furnishings and other products based themed commercial wholesale market. Huadu District is the only largest and most concentrated variety of decorative materials the city. Flowers decorate the city with building the first large-scale, two-story street Pu of about 13,000 square meters, divided into A, B, C, D four. Block A: The main business kitchenware, ceramics, doors and windows; B Block: The main operating hardware, plumbing ware, chemical coatings; C Block: The main business lighting, fabric; D Block: The main operating iron and other decorative materials, are also worthy of its varieties and grades Flora said the most. Counterparts in Huadu, Huadu City, not only architectural decoration has the largest market area, also has the largest outdoor car park. Market was divided into two layers, each layer height in meters, for material goods and the flow characteristics, the implementation of zoning layout of the operation, according to business needs, without losing the request of a unified style, its own exhibition space and flexible layout. Meanwhile, the Huadu City also broke the traditional architectural building materials market crowded business, with large channels, and the day in a transparent roof to absorb natural light. 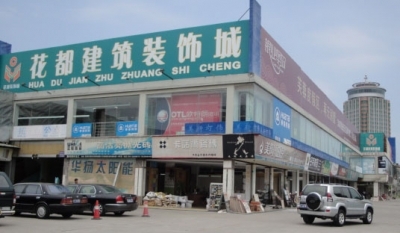 We will also use the advantages of industry, the government appealed to the gradual improvement of market development and expansion of the second phase as soon as possible to improve the surrounding environment, to guide the market around, so that consumers can here, and large brand decorative materials, small parts All shopping. Convenient one-time purchase decoration materials, and ultimately the formation of brand-name decorative building materials wholesale, transportation, distribution logistics base for the whole building. Flora building decoration market with "innovative and realistic benefit of million" business philosophy. From management to service, from communication to accept flexibility, strengthen the development of pragmatic focus in the market as the main wave of the sea in the spirit of customer service, consumer business purposes highly responsible, quality assurance, honesty. I have 80% of goods than those in the city center is about 10-15% lower price stores, opened more than a year in our sales year over year in the growth rate reached 40%. Necessary to build the brand image of quality and cheap flower decoration materials market, carrier, so that we the latest, best, best quality, best service to clients. Currently the city has been decorated to create their own "architectural business information network" platform, the latest, most stylish and quality products, the brand through this portal radiation to Guangdong, China, and even abroad, to create a distinctive decorative material Huadu industry. Continue to enhance the overall strength of the product at the same time, the introduction of "one-stop service", will be the choice of materials, design, price, budget, decoration and other decorative processes integrated into the business philosophy in the city, so that the flower decoration, decorated overall strength of the market to a new level.